Doomsday headlines about the impending robot coup to rob you of your job saturate the media. Terrifying declarations fly from every direction: automation equals job losses. No job will be safe from the horrors of automation. Not even yours. This unhelpful fear mongering simplifies a deeply complex issue, and spectacularly dodges thorny questions about power, wealth, precarity and inequality. The question “What is the Future of Work?” is important. But hastily cobbled together answers to an intricate issue are often lacking in nuance and deliberation. Many projections around the future of work are also detached from the lived experience of those who actually find themselves replaced by a machine, redundant in the workplace. Such projections are often made by people who believe their own job probably isn’t vulnerable to the threat of automation. How would you feel if you lost your job to an invisible code, a robotic arm, an algorithm? What happens to you – trend forecaster, policy maker, marketeer, curriculum planner, decision maker, statesperson – when you find yourself obsolete? What if the trend you contributed to, consumed you? 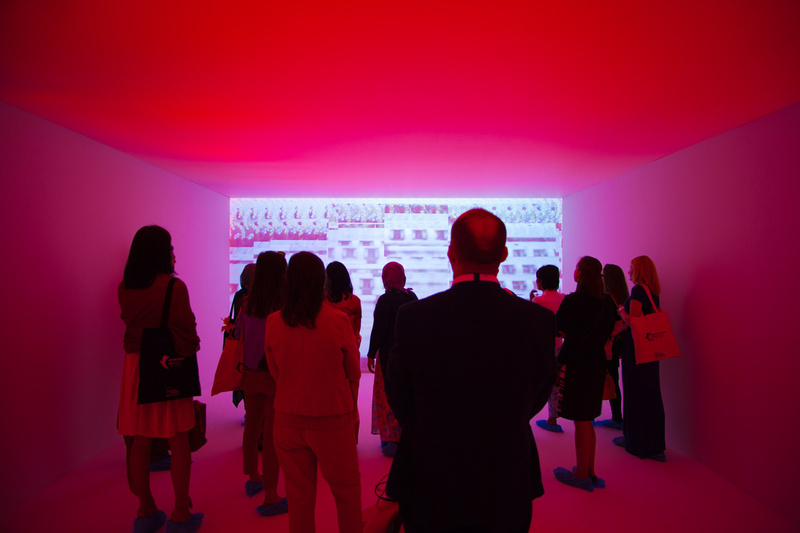 The Varkey Foundation invited us to build a highly experiential simulation, to provoke a diverse group of educators, decision makers and students about the future of education. We wanted to transport them straight to the beating heart of the issue, to look and feel what the world of work might look like if these automation trends came to fruition. We created two deeply immersive, theatrical simulations at opposite extremes, so people could experience their implications. 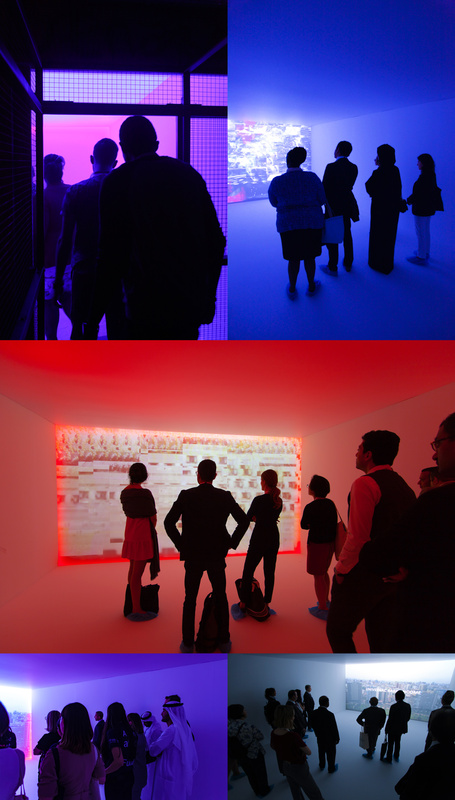 This polarity gave visitors a chance to reflect on their own perspectives and decisions and contemplate the space between two possible future worlds, which are often branded as “utopia” and “dystopia”. You find yourself in a queue of people, waiting to enter a large, black box. Above the desk, a racing montage of automation images and videos begin to put you on edge as you wait. After your personal details are taken, you – and everyone else in the queue – are informed you have been made redundant. You stand amongst fellow educators: all redundant. You look back at the shocked faces behind you and see the Evening Standard’s editor (and former Chancellor of Great Britain) George Osborne, has also been made redundant. Everyone has. Slightly stunned, you are guided down a dilapidated alleyway by a Workshare employee, himself on a micro-shift and tense with the pressure to perform this small task as optimally as possible. The grim backstreets of the city are vast and winding. Before you are scanned at the entrance, you see the 1% luxuriating in their wealth through a gap in the fence. 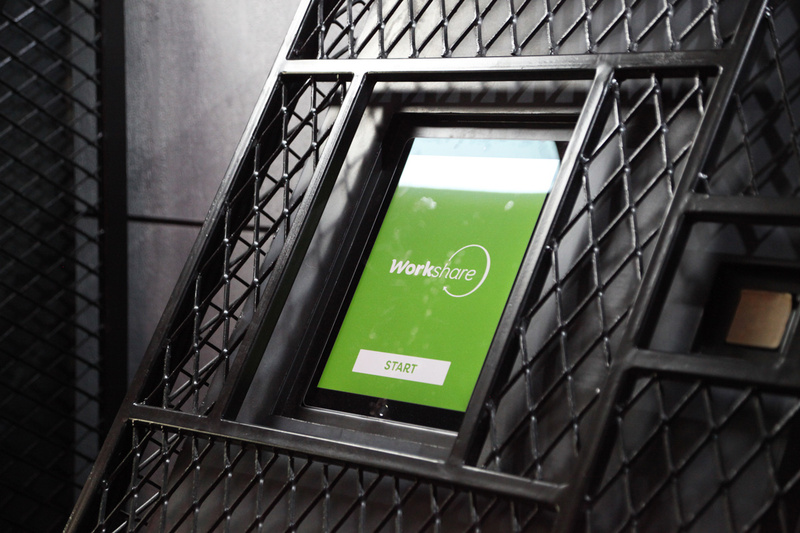 At a run-down kiosk your Workshare guide explains the AI responsible for allocating jobs. All options are considered, but there is no regular work available. Finally, the system comes up with a job for you. A micro job. A tiny, precarious gig that robots can’t do and calls for human dexterity: cleaning the interiors of self-driving uber cars. Your former colleagues in the queue behind are recruited for similar jobs. Suddenly, an alarm reverberates through the space and you are shoved into a metal cage, and given a uniform to change into. News from a small television fixed to the wall of the cage blasts headlines of rising political unrest. There is deep unrest as civilians are angry about the concentration of power and wealth in the hands of so few while everyone else is left behind. But, the particular visions of automations currently being offered need not be the only way forward. Other futures are possible. 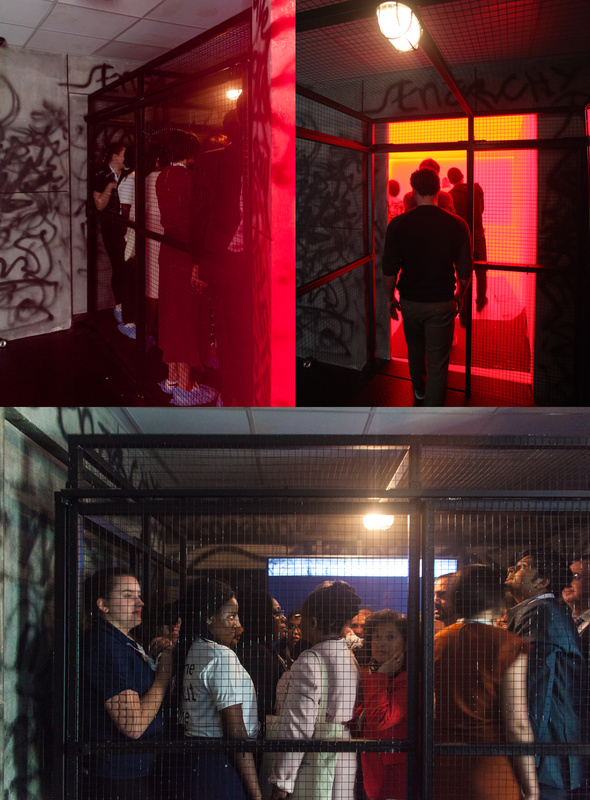 In the second simulation, we drew people into an exploration of multiple possible futures which are not bound within singular narratives.Everyone is released from the cage, to step inside a room where soft, slowly changing hues cocoon after the harshness of the metal prison. A serene, disembodied voice calmly proposes a stream of questions and concrete possibilities around the future of work: visions of another world where automation could herald hope rather than despair. This simulation was designed to activate alternative thinking. Influential educators and decision makers were primed to consider the stark choices they are making today. We wanted to jump start their imaginations, so they felt ready to build a future with the potential to free us, enable us, and assist in the essential healing of political and social divides needed to collectively confront the approaching ecological tsunami of climate change. We are very inspired by Stuart Candy and Peter Hayward’s work “The Polak Game: Where do you Stand?” and with their permission, reinterpreted it for this project. 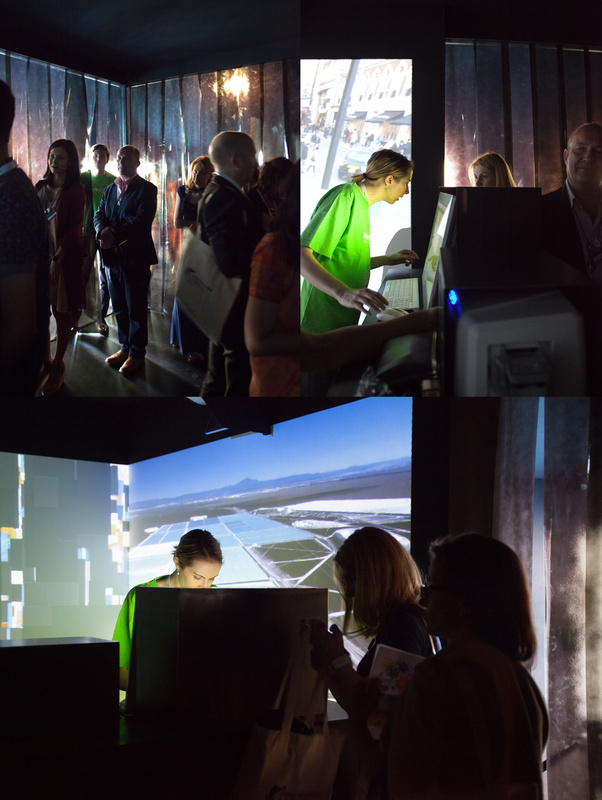 After experiencing both simulations, visitors entered a decompression area where their responses could be mapped on an axis according to their outlook on the future of work. 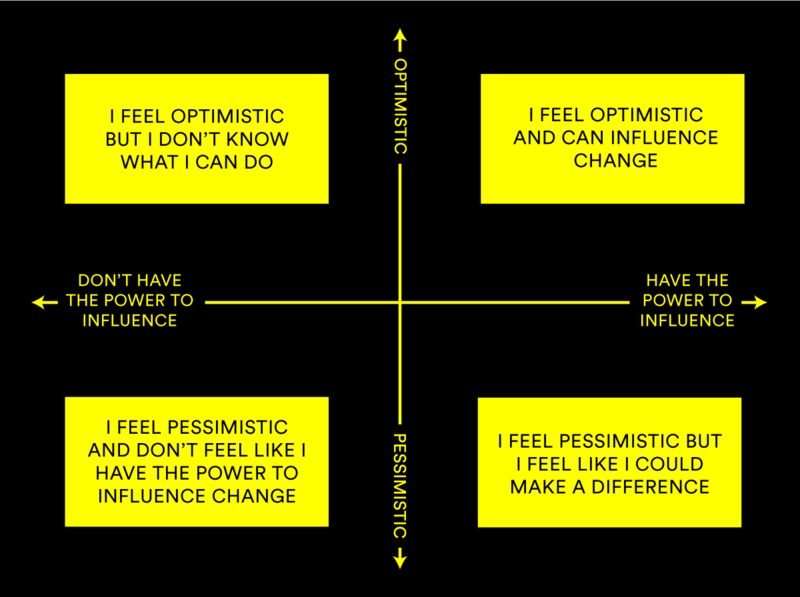 At either sides of the emotional spectrum, responses ranged from simply “Optimistic” to a hastily scrawled “Anxious”. 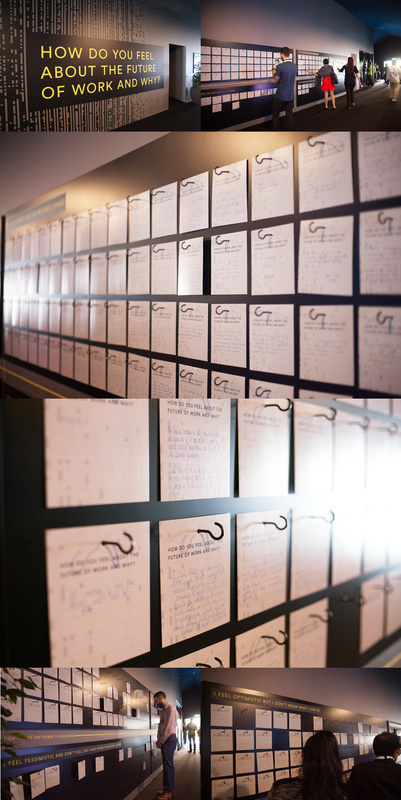 Fortunately, the bulk of handwritten notes spoke of their own agency, overcoming fear, embracing the future, critical thinking, speculative thinking, and the need to ruminate and imagine possibilities for human collaborations with technology. The theatrical and immersive future experience proved emotionally compelling and stirring for the audience. 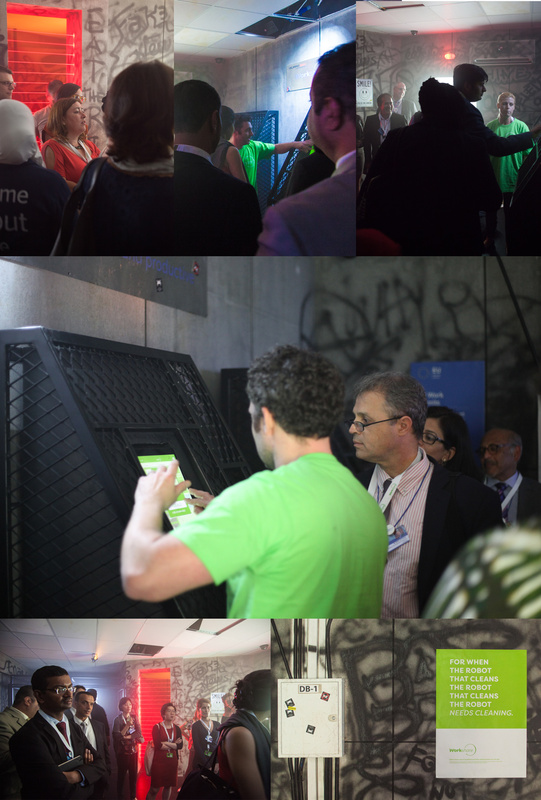 Over the course of two days, we had Heads of State, CEOs, Technology companies, educators, policy makers, journalists and students visiting us, and contributing their insights to the wall panel. 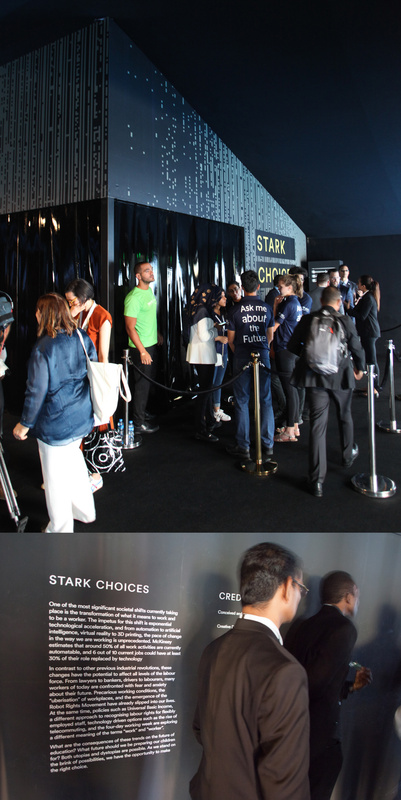 The insights and recommendations from the audiences, alongside the live data capture and interviews have directly informed the future strategy and vision not only for Varkey Foundation, but also several other organisations who participated in the simulation. 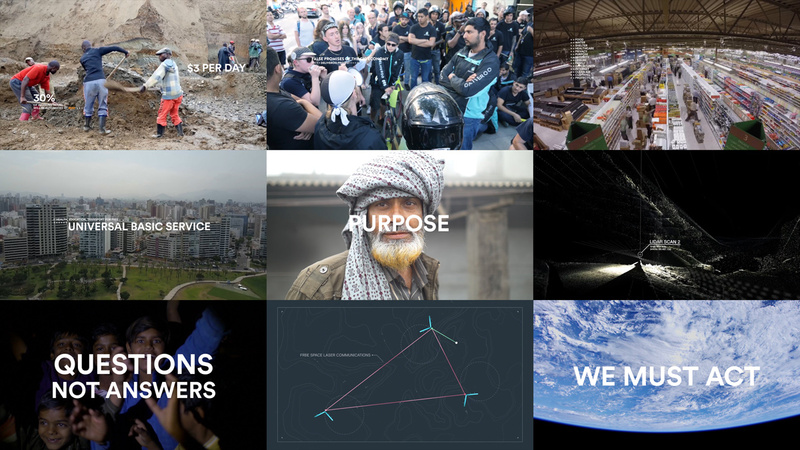 Collectively, we anticipate that these strategic visions will shape how we will work in the future.